A fun and simple file folder activity, easy to assemble and easy to use! An excellent way to teach or reinforce basic concepts. Children get to learn while playing and having fun! 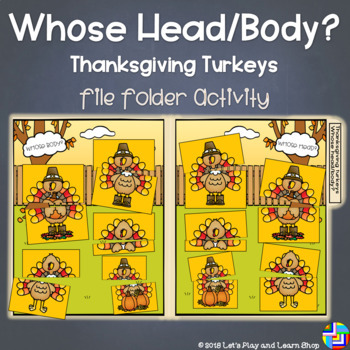 asks children to MATCH THE HEAD TO THE BODY and the BODY TO THE HEAD of 5 TURKEYS. The folder and tab labels. Paste these accordingly. 2 Game pages/templates. Paste these inside the file folder. 1 Game cards page. Cut these out and then laminate and keep them in a baggie or an envelope. Once you assemble the file folder, you are encouraged to laminate it for durability. You may add velcro if you wish. This way you can use it over and over again!